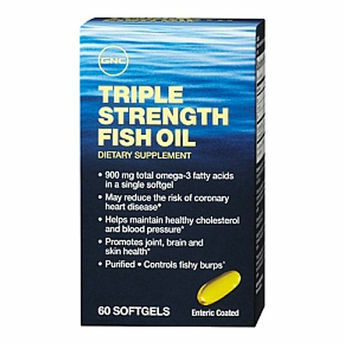 GNC Triple Strength Fish Oil SoftGel Cap 1x120 contain Fish oils naturally provide the heart-healthy omega-3 fatty acids EPA (Eicosapentaenoic Acid) and DHA (Docosahexaenoic Acid). The omega-3 fatty acids found in fish oil are necessary for heart health. They help support normal, healthy cholesterol levels and are necessary in the maintenance of normal blood pressure. Explore the entire range of Omega Fatty Acids available on Nykaa. Shop more GNC products here.You can browse through the complete world of GNC Omega Fatty Acids .